Equinox Half Marathon | Run. Work. Live. Repeat. Diving for home plate is a great idea when you’re a pro baseball player and you’re aiming to score the winning run to clench the World Series at the bottom of the ninth with two outs. It’s a really bad idea, however, when you’re a middle-aged woman running the streets of your neighborhood one day and you trip and it’s how you land, smack with your left arm outstretch overhead and flat before you can catch yourself. Yes, this is what I did back in July, just as I was getting ready to join my friend Pam as a pacer for the Vermont 100. About a week and a half before her race I fell and landed on my left shoulder. I tore my rotator cuff and I had to take almost two weeks off running, plus I had to cancel on being a pacer for her race, which I was really looking forward to doing. The way I landed and fell, I still don’t know how I didn’t hit my head as well, which would have been worse. A guardian angel must have been watching out for me. My shoulder injury was a first — it was running related and yet had nothing to do with my legs or lower body. Still, it has affected me and my running. I had to ease back into running and my mileage as my shoulder was tender those first few weeks when I ran. Initially, the worst part of the injury was trying to wash my hair or pull off a jog bra over head. It also made upper body cross training almost impossible. I’ve been in physical therapy for a few months now and I’m happy to report that I am almost back to full use of my left arm and shoulder, with minor or little discomfort, but it’s taken a loooooong time to heal, about three months now. The whole episode has taught me many lessons: Pay attention when you’re running, even on your everyday route. Don’t take your health for granted because you never know when something bad can happen. Running uses more than just your legs — you need your whole body to cooperate and do well. You gotta take good care of yourself. Healing takes patience and lots of time, especially as you get older. Our bodies change, whether want them to or like it or not. I’m not completely out of the woods yet, and I’ve noticed I get vertigo easier lately. A few times since my accident I’ve caught myself almost tripping again, especially as I get tired over the weeks from my collective training. During the summer I took my son to a local amusement park and I tried to ride some of the big, crazy rides with him and I found myself struggling. I never got motion sick when I was younger and I used to love that stuff, but now I can’t do it anymore or have to be more cautious if I do. This past week I swam for the first time and I have progressed with physical therapy to doing modified planks and only needed to visit my therapist every two weeks. I am healing and grateful for it, but I also have no illusions. I’m going to have be careful with that shoulder from now on, probably for the rest of my life, so as not set it off again or re-injury it. I was lucky to not need surgical repair for it. Human beings are simply not built for “diving for plate” on concrete surfaces, even midlife ninjas like myself. No “Run. Fall, Heal, Repeat,” is needed in my world and I hope I have filled my quota for awhile, thank you very much. My training, despite the craziness of my mishap, is going well and so is the rest of life. My husband has been participating in bike rides and races. My kids are getting bigger and more independent and they are doing well in school and their activities. I’m now a grad student at the UC Denver Urban Community Teacher Education program and I’m enjoying it, learning a lot and doing well. I’m running and training well, too. Here’s proof. 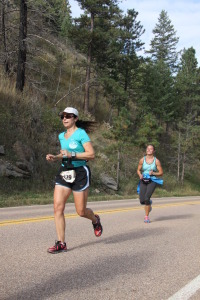 In September I did the Equinox Half Marathon in Fort Collins, Colorado, as a training pace run for my next marathon, the California International Marathon. 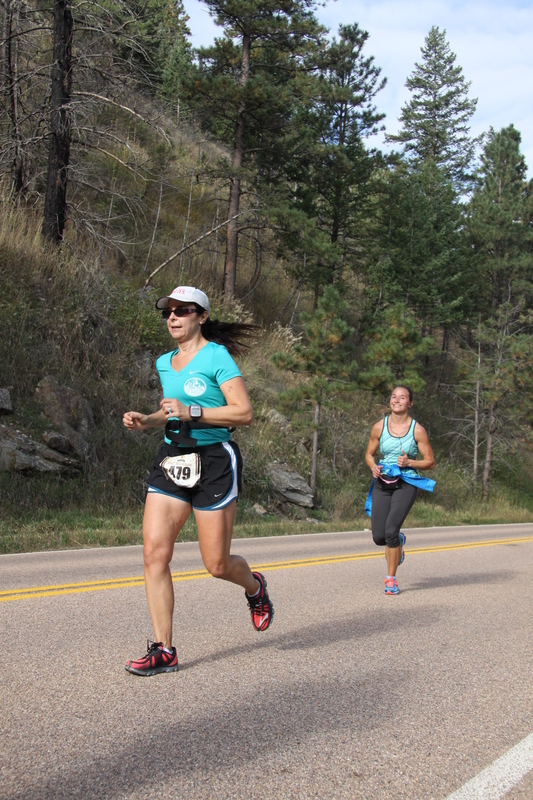 The Equinox race is well organized and I loved the scenery. My only complaint would be that it takes place on road in Poudre Canyon and it’s kept open to traffic, which means you can only run on one side, you have to dodge cars, and it tends to be sloped heavily. My hips didn’t care for the sloping/uneven pavement. Overall, however, it’s a good local race for Coloradans. Resilience comes in all forms — mental, physical and emotional. While I would rather not repeat my shoulder injury I am grateful for the lessons I’ve learned and looking forward to running in Sacramento in December. I’ll keep you posted on my progress.